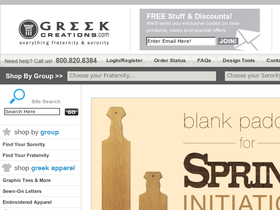 If you are looking for the perfect store to find everything for your Greek sorority or fraternity then Greek Creations, online at Greekcreations.com, is just the store for you. Greek Creations offers a huge selection of Greek apparel and clothing, sorority gifts, and fraternity merchandise. Find things from american apparel, sew-on letters, embroidered or rhinestoned apparel, gifts, Greeks, bags and totes and much more. Also available through Greek Creations, is the option for you to custom design t-shirts so that they are decked out in your favorite Greek sorority or fraternity. So when you want to make your sorority or fraternity the coolest on in town, check out Greek Creations. But first, be sure to stop by RetailSteal.com to find the best Greek Creations coupons, Greek Creations promo codes, and Greek Creations discounts. All orders placed with Greek Creations are shipped upon completion via UPS, Fedex and USPS. Orders over $100 come with free shipping. The expected arrival time differs depending on when your order is completed and the destination zip code. See website for full details, exclusions may apply. Enjoy $10 off your order of $100 or more when you use this coupon code online at GreekCreations.com. Shop online at Greek Creations and save 5% on your purchase when you use this promotional code. Head on over to Greek Creations to find select Greek letter t-shirts at 25% off. Click link for selection. Right now GreekCreations.com is offering 15% off on select ladies Greek letter T-Shirts. Click link to view.